A SECOND FINE Gael TD has hit out at Taoiseach Enda Kenny and his own party over the controversial appointment of John McNulty to the board of the Irish Museum of Modern Art (IMMA) days before he was nominated to run for the Seanad. 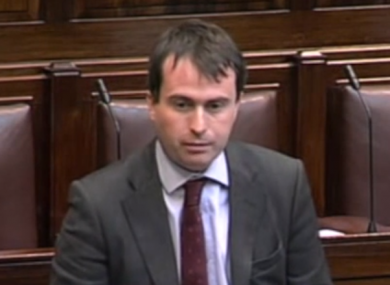 Seán Conlan, a TD for Cavan-Monaghan, told RTÉ Radio this morning that the McNulty appointment was “a mistake” and “totally wrong” adding that it “damages the image of Fine Gael”. He hit out at Fine Gael and said that the actions of Arts Minister Heather Humphreys, in appointing McNulty to the IMMA board, and Enda Kenny “have damaged Fine Gael”. His comments follow Waterford TD John Deasy’s strong criticism of Fine Gael, Kenny and some Cabinet ministers yesterday in the wake of the McNulty row. Conlan said the McNulty appointment appeared to be “stroke politics at its worst” and said Humphreys should state whether she knew McNulty was to become the party’s Seanad candidate when she appointed him to the IMMA board on 12 September. “It stretches credulity to believe she didn’t know what she was doing when she appointed him to the board and I mean the general public are not stupid. The general public can see what’s going on here,” he said. This afternoon, the Finance Minister Michael Noonan has sought to play down the controversy, telling RTÉ in Limerick: “We’re a very big party where you take the Dáil and Seanad together and then with Labour involved, it’s almost a national government and there’s bound to be differences of opinion. He said that differences of opinion expressed at parliamentary party meetings are not unusual and that the only difference this time is that these views are being aired in public. “Like all big parties it will be worked out in due course,” he added. Privately, several TDs have agreed with Deasy’s comments yesterday but have been reluctant to go public with their views. The same TD said there was an “awful lot of people” within the party who shared the view but insisted that it wasn’t about begrudgery. “The thing about it is, it’s very easy to confuse this with begrudgery but if the Fine Gael brand is damaged it damages our chances of re-election,” they added. Several other Fine Gael deputies we contacted yesterday said “Yes” or “I agree completely” when we asked them if they agreed with what Deasy had said. However some TDs were less critical, one saying the McNulty debacle was “a mistake” but that the party had to move on. Speaking on RTÉ’s News at One, Kenny’s constituency colleague in Mayo, Michelle Mulherin said Kenny does not get enough credit for what he does. She said McNulty would have qualified for the Seanad’s Cultural and Education Panel without his appointment to the IMMA board and defended the Donegal-based shop owner’s candidacy. The matter is now likely to be raised again at the Fine Gael parliamentary party meeting next Wednesday where Kenny, who missed this week’s meeting, will be called on to account for his actions in the McNulty debacle. Elsewhere, Fianna Fáil has called on Enda Kenny to re-run the by-election process — but, speaking this morning, Sinn Féín’s Mary Lou McDonald said her party had received legal advice that that wasn’t possible. “I know that there have been calls for the process to be rerun and if that were possible I think that would be the desirable thing to happen, but our advice is that that’s just not possible within the rules and constitutionally,” she told reporters in Dublin. Email “FG TD thinks McNulty appointment is 'stroke politics at its worst'... and he's not the only one”. Feedback on “FG TD thinks McNulty appointment is 'stroke politics at its worst'... and he's not the only one”.